Meet Maraschino! He’s a lovable rabbit looking to find a calmer home where he can kick back and relax. Maraschino is a bit shy at first, but once he has time to settle in he is a very sweet little guy who loves to receive head rubs from his family. 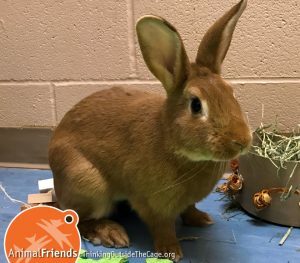 Maraschino may even like having a bunny friend in his new home – our Adoption team will help you with a meet and greet beforehand. Does Maraschino sound like the perfect addition to your family? Stop by Animal Friends to meet him or contact our Adoption team at 412.847.7002 or AdoptionInfo@ThinkingOutsideTheCage.org.